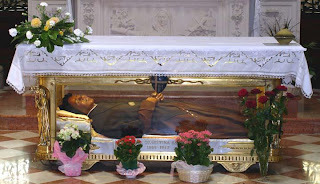 Catholic News World : Saint February 8 : St. Josephine Bakhita - #Slave to Saint + Litany Prayer - SHARE! 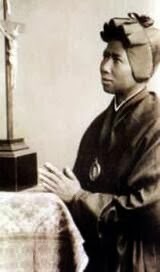 Saint February 8 : St. Josephine Bakhita - #Slave to Saint + Litany Prayer - SHARE! In 1876 two men kidnapped Bakhtia, who was then about seven years of age. After a month's imprisonment she was sold to a slave-trader (the second master). With great courage the girl attempted to escape, but was recaptured by a shepherd (her third master) and sold again to a fierce-looking man (her fourth master) who sold her to a slave-trader (fifth master). One day she was beaten and left unconscious and bleeding on the ground. She was then sold to a Turkish general (6th master), whose wife subjected Bakhita to the torture of tattooing. Her torturer spared only her face, because it was very beautiful, while he inflicted 114 cuts with a razor on her stomach and arms. The poor little victim felt she was dying, especially when salt was rubbed into her wounds to keep them open. Immersed in a pool of blood, she was carried away on a pallet and left for a month without even a rag to dry the serum that oozed from her wounds. Mr. Michieli, a rich businessman from Venice, took Bakhita with him to his villa at Zianigo, near Mirano Venetto. Here, for three years, Bakhita was nursemaid to the little daughter, Alice, nicknamed Mimmina. The Michieli were good, honest people, but not church-goers. Mrs. Turina Michieli, who was Orthodox, had forbidden Bakhita to enter a church. However, Providence had placed on Bakhita's path the Michieli's manager, Illuminato Checchini, who played a fundamental part in her journey of faith. "A man with a heart of gold and an enlightened conscience" was how Bakhita described him; he always had a "fatherly love" for her. It was he, in fact, who concerned himself the religious education of the young African. When the Michieli returned in 1886 to Africa, where they had acquired a large hotel at Suakim and took Bakhita with them, the good Illuminato felt remorse, because he had not yet been able to speak to her about God. He was, thus, very happy, the following year, when he saw her return with his wife and the little girl, and inwardly promised to do everything he could for the benefit of that soul. "The missionaries", he said, "go to Africa to convert its inhabitants, shall we do nothing to enlighten this poor girl?" He began by presenting her with a little crucifix, saying to himself: "Jesus, I entrust her to you. Now, you look after her". He was also instrumental in placing Mimmina and Bakhita in the care of the Canossian sisters in Venice when the Michieli had to leave again for Suakim. At this Institute Bakhita was admitted to the catechumen ate. When, after nine months, Mrs Michieli returned for her daughter and the girl whom she regarded as in some way, her slave, in order to take them back again to Africa, she encountered a very firm attitude on the part of the latter. It was on that occasion that Bakhita, who was still a catechumen, displayed singular strength of spirit and great faith. In fact, when confronted with the affection and economic security offered her by the Michieli family, and the hope of rediscovering her family if she returned to Africa, she preferred God's love and abandonment to divine Providence for her future, which in human terms, was very uncertain. Thus she said, with determination: "No, I cannot return to Africa, because I would not be able to profess my faith in the Lord. I love the lady and her little girl very much, but I cannot lose my God. So I am remaining". It was 29 November 1889, as bakhita later recorded in her memoirs. This moment of courageous decision is most significant; it was to set the tone for her entire life. In this difficult struggle Bakhita had the support of the Patriarch of Venice and the King's Procurator, who, according to Italian law, which forbade slavery, declared her to be a free person. "If I did not die", Bakhita was to say later, "it was by a miracle of God, who had destined me for better things". After she had been baptized, receiving the names of Josephine, Margherita and Fortunata, Bakhita remained at the Institute of the Catechumens, where she soon became aware of the call to a life of special consecration. She did not dare expressed this desire, feeling herself to be unworthy. She feared that she might disfigure the Congregation on account of her black skin. Her confessor reassured her. God does not look at the colour of one's skin, but rather at the innermost depths of one's heart. 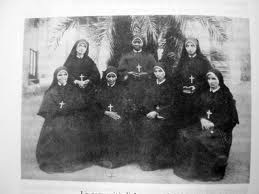 Bakhita was accepted, and after three years of Novitiate she made her Vows on Decembe 8, 1896. Cardinal Sarto, the then Patriarch of Venice, examined her and told her: "Pronounce your holy vows without fear. This is what Jesus wants. Jesus loves you. Love Him and serve Him always in this way". He also reassured her about the eternal salvation of her dear ones: "God has infinite ways of making Himself known and when He chooses a person to be His bride, He also thinks of her family". After her religious profession, which took place in Verona, Mother Bakhita returned to Venice, and later was sent to the house in Schio. Here she spent the best part of 45 years, immediately gaining the sympathy and esteem of all the town's inhabitants, who began to call her affectionately 'Madre Moretta' (Black Mother). Bakhita achieved the ideals set by the Foundress, St. Magdalene of Canossa, who wished her daughters to be "anchorites and apostles". Whether in church or sacristy, at the door or in the kitchen, she was engrossed in her Lord, and daily bore witness to the Lord's love for all His creatures. During the First World War, with great love, she set about easing the physical suffering and moral anguish of all those around her, in particular, the soldiers looked after in the Institute, which had been turned into a military hospital. During the Second World War people attributed to her presence the fact that Schio was preserved from the bombing. In fact, when the alarm sounded, Bakhita would say, "Don't worry, because the 'Master' knows what He has to do nothing will happen here." From the moment of her profession, she showed how close she felt to her African brothers and sisters. On that day she uttered the following heartfelt prayer: "O Lord, if I could but fly to my people and preach aloud Your goodness to everyone! Oh, how many souls would I win for you. Among the first would be my mother, my father, my brothers, my sister, still a slave... all, all the poor black people of Africa. Grant, Jesus, that they too may know and love you!" Between 1936 and 1938 Mother Bakhita was at Vimercate, the seat of the Canossian Missionary Novitiate. This was her base for journeys to various Italian cities to promote the missions. She was accompanied by another Sister, who had returned from her mission in China. Everyone wanted to hear first-hand her "wonderful story". Referring to this experience, Mother Bakhita was to say later: "Many will think I enjoyed travelling around, but for me it was real martyrdom". Wherever she went, she left goodness in her wake, even though she herself was not aware of it. At the height of World War II, on December 8, 1943, Mother Bakhita celebrated the 50th anniversary of her religious life. Not only her own community, but the whole of Schio, celebrated, despite the adverse circumstances of the time. But now, for Bakhita, aches and pains were beginning to make themselves felt, crippling arthritis, asthmatic bronchitis with cough, convulsed her body. This was not to be wondered at, considering the suffering she had undergone in her younger years and the rigours of the northern climate to which she was not accustomed. During her long illness never a complaint passed her lips. When she was asked: "Don't you feel anything, Mother Bakhita?" She replied: "Of course I feel something - I'm alive; it's only the dead who can't feel anything". "And how is it that you never complain?" "Oh, when nature wants something, I say: now be good, we'll see about it. Then I think about Jesus on the cross, and about the Sorrowful Virgin. That way, nature is calmed, and I no longer need anything". What heroic patience! Very soon she had to abandon her walking-stick in favour of a wheelchair, until broncho pneumonia brought her inexorably to the end. Fully conscious, and to the great edification of all, she received the last sacraments. The Virgin Mary came to comfort her at the moment of her death on Saturday, February 8, 1947. "How happy I am... the Madonna, the Madonna! These were her last words as she passed from this earthly life to the full freedom of God's children. From her childhood, Bakhita learnt to wonder at the beauty of creation. Even as a slave, she found comfort in admiring the sun, the moon, and the stars. She told how, when she had, finally, lost hope of ever seeing her family again, she began to appreciate more the beauties of nature. She wondered who could have been their Maker and ardently desired to know Him so as to be able to thank Him and do Him homage. She was utterly surprised when she began to grasp the meaning of this truth: through Baptism you will become a child of God. "A child of God - I, a poor black girl! ", she would repeat, filled with amazement. Her baptism gave her such great joy that she felt its beneficial effects ever after. "Here, I became a child of God!" she exclaimed with emotion, kneeling at the baptismal font when she had the good fortune to visit the church where she had been baptized. Baptism shaped her human and Christian future completely, and her whole life was overwhelmed with wonder at the goodness of a Father who orders everything for the good of those whom He has chosen. This, then, was the source of Bakhita's constant goodness. The moment that had a great and decisive impact on her life was when she discovered the infinite love of God, manifested in his Crucified Son. Seeing the image of Jesus on the cross for the first time, Bakhita was greatly impressed, and asked: "What did that man do that was so wrong, for him to be treated in such a way?" "Nothing," was the reply, "He wished to die for us, for love of us, and also for you". "Also for me!" astonished Bakhita repeatedly. Always drawn irresistibly by the love of Jesus who had died on the cross for her, she became a strong woman, firm and unshakeable in her decision to devote herself totally to the service of her new heavenly Master. Consequently, her former resignation to her fate was transformed into free and holy abandonment to the divine will of Him whom she still gladly called "el Paron", "the Master", out of long-standing mental habit, but now no longer as a slave of arbitrary and evil masters by fate, but as a "slave of love" carrying out the orders of the good God, who loves His servants as a Father. "In St. Josephine Bakhita we find an outstanding witness to God's fatherly love and a bright sign of the enduring value of the Beatitudes. In our time, when the race for power, money, and pleasure causes distrust, violence and loneliness, the Lord is giving us Sister Bakhita as the Universal Sister, so that she may reveal to us the secret of the truest happiness: the Beatitudes. Hers is a message of heroic goodness, mirroring the goodness of the heavenly Father. She has left us a testimony of evangelical reconciliation and forgiveness, which will surely give comfort to the Christians in her homeland, Sudan, so sorely tried by conflict that has lasted for many years and caused many victims. Their faithfulness and their hope are reason fro pride and thanksgiving on the part of the whole Church. At this time of great tribulations, Sister Bakhita goes before them on the road of imitation of Christ, a deepening of the Christian life and of unshakeable attachment to the Church." (John Paul II - May 17,1992). Mother Josephine Bakhita's life is marked by unconditional surrender to the will of God. Her motto was "What the Master Wishes". Thus she made her spiritual life very simple, because "doing God's will well" is the essence of perfection. In all the positions she held as a Canossian - cook, embroiderer, sacristan, portress - Bakhita always showed herself to be a true "Daughter of Charity, Servant of the poor". The virtues that mark her relationship with her neighbours are: Goodness, Meekness, Tenderness. Her black hands caressed the heads of the children who attended the Institute's schools daily. Her amiable voice, which had the inflection of her African songs, was pleasing to the little children, comforting to the poor and the suffering, and encouraging to all who knocked at the door of the Institute. The value of forgiveness is evident in Bakhita: "If I met those slave traders who kidnapped me and treated me so cruelly, I would kneel to kiss their hands, because if that had not happened, I would not be a Christian and a religious today." One is impressed above all by the excuse she makes for them: "Poor things, maybe they did not know they were hurting me so much: they were the masters, I was their slave. Just as we are used to doing good, so they did that by force of habit, not because they were wicked". As she told her terrible story, she continued to thank the Lord, who, in unimaginable ways, had led her to the faith and made her His bride. There was no hint of resentment in her words: she had forgiven everyone from her heart and prayed for them all. St. Josephine Bakhita body remains incorrupt. Lamb of God, who takes away the sin of the world, Spare us, O Lord. Lamb of God, who takes away the sin of the world, Hear us, O Lord. Lamb of God, who takes away the sin of the world, Have mercy on us, O Lord. Heavenly Father, Your Son Jesus Christ, through His suffering and death on the cross, gave Himself as a gift of love for the reconciliation and salvation of all his peoples. 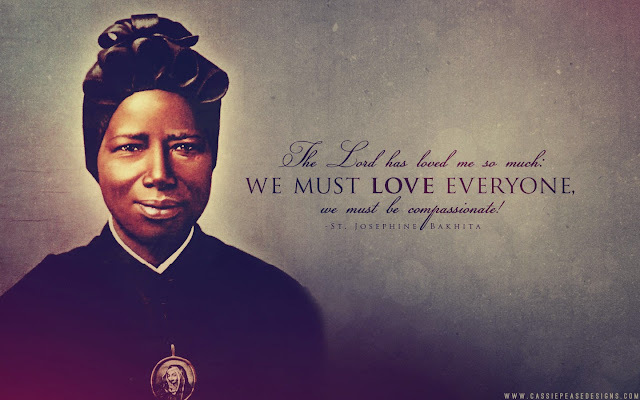 He continues to express this love by giving us St. Josephine Bakhita. She too offered herself through her suffering in slavery. We humbly pray that through her intercession, she may obtain for us this favour which we now ask ______________, for the needs of our parish community, for her brothers and sisters in Sudan, and for the whole world the gift of justice and peace. We ask this through Christ, our Lord. Amen.